Before Caley Trepac came to Rush University Medical Center last November to undergo brain surgery, a friend gave her a teddy bear. Trepac, who was 14 at the time, held the stuffed animal close throughout her weeklong stay at Rush. “It comforted me and made me feel loved,” she told a Chicago Tribune reporter. While walking the halls of the pediatric intensive care unit during her recovery, Trepac saw children who also had serious medical conditions but who didn’t have their own doll to comfort them. As the first anniversary of her successful surgery on Nov. 5 approached, Trepac decided that she wanted to mark the occasion by collecting teddy bears and donating them to Rush to distribute to pediatric patients. She succeeded beyond her wildest dreams. 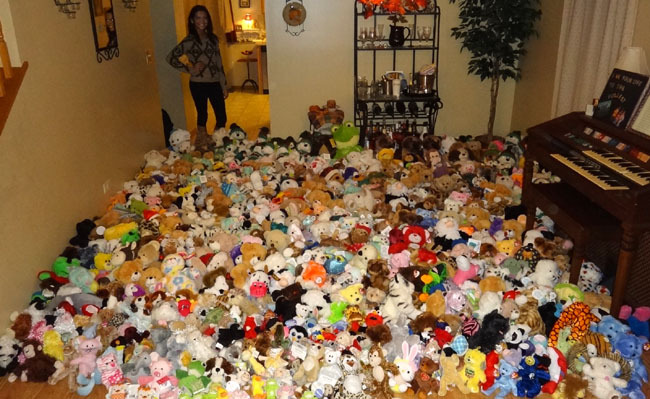 Earlier this month, the Plainfield resident and her family delivered more than 750 stuffed animals to Rush. “I reached out to friends on Facebook, and word spread like crazy,” says Trepac’s mother, Wendy Frydrych-Trepac. Local businesses, the Plainfield Public Library, and even members of a rival high school volleyball team collected stuffed animals, and the family received financial donations to purchase additional dolls from as far as Massachusetts. Trepac has Chiari malformation, a structural defect that causes part of the brain to be pushed down from its normal location into the opening to the spinal cord and the upper spinal canal. The pressure that results can affect the functions controlled by these parts of the brain. Her condition was diagnosed after she began developing headaches and vision problems. Lorenzo Munoz, MD, a neurosurgeon at Rush, removed a portion of Trepac’s skull and parts of two of her vertebrae and opened a membrane around her brain to relieve the pressure on her brain. Thanks to this treatment, Trepac’s condition has returned almost entirely to normal. “She misses school here and there and she can’t do anything that would jar her neck, like contact sports, but she does most things normal teenagers do. If you saw her, you wouldn’t know she had anything,” Frydrych-Trepac says. Now thanks to Trepac’s empathy for other children and the outpouring from her community, hundreds of Rush pediatric patients will find their own time in the hospital a little bit easier. This entry was posted in Children, Neurology and tagged Chiari malformation. Bookmark the permalink. does anyone know if they are still collecting?